If you walked around the halls of Mobile World Congress you saw Virtual Reality being showcased constantly with some demo experience wait lines stretching two hours. The application of VR throughout the show was fascinating ranging from cyber security marketing in the innovation city to a roller coaster ride and underwater experience. What really stood out was the headset not being used alone, rather pushing the bounds into 4D experiences. These 4D experiences combined the VR with audio and seat movement, created a truly immersive experience that tricked the mind. Even after watching people go through the experience ahead of you in line, when you were the one with the headset on, you were transported to a new place. This showcased the huge potential for the future of VR in the entertainment industry. One can imagine adding even more 4D sensory experiences like air, temperature and scent to further enhance the experience. It will be interesting to see the adoption of this technology in the coming years. The idea of 5G was being shared widely throughout the conference halls even though 4G is still rolling out to many nations around the globe. Imagine being able to download an episode of your favorite show in seconds rather than minutes, but more important than speed of content consumption, is the idea that 5G is key to unlocking the future potential of the Internet of Things (IoT) scenario. Analysts are forecasting networked devices to surge to over 25 billion by 2020, ranging from watches to appliances, cars to healthcare systems and many more. With the volume of devices and data, this new speed will be critical to delivering on the promise of IoT. However, with 4G still rolling out to many countries around the globe, not just maturation of the technology, but the economics of 5G will be critical. 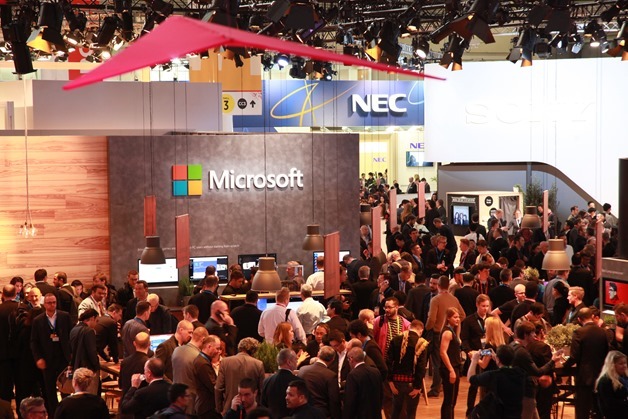 Throughout the conference, the idea of connected devices was showcased from cars to smart bicycles, door locks to digital art displays and many enterprise applications. The use cases for this technology are becoming more and more clear in the industry, however, there is still fragmentation across the available stacks. There is substantial progress being made by partners like Microsoft, intel, and others through the Open Connectivity Foundation to build the linking between software providers and the internet of things. Learn how you can better retain and engage your users through mobile, check out Azure Mobile Engagement.